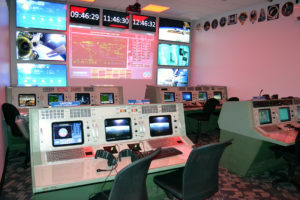 Renovations to the education rotunda at the Kansas Cosmosphere included a new Mission Control Room that features equipment previously used at NASA. The new room is realistic enough that when a visiting astronaut saw the space, he immediately wanted to postpone his other appointments and role play a mission! Since it was completed in April, the rotunda has been used consistently by student groups from across Kansas and 34 states. Students from sixteen Northwest Kansas communities have been among the visitors thus far. A grant from the Hansen Foundation assisted in the renovation project.